You're dating a new girl and things are going great. Then one day she asks you to meet her ex...who just happens to be Superman. Can a mere mortal ever live up to the Boyfriend of Steel? 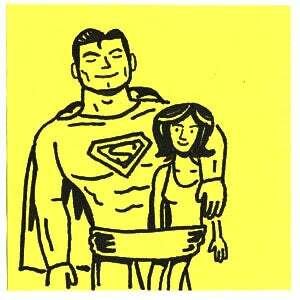 Jonathan Goldstein's short story "Man Not Superman" (previously featured on This American Life) follows the man who dates Lois Lane after she breaks it off with Superman. Our comparatively ordinary narrator is head over heels for the famed reporter, and things go swimmingly at first; sick of superheroes, Lois just wants a guy who can make her laugh. But Lois and the big Kryptonian are still good chums, and the relationship hits a snag when Supes insists on taking his ex's new beau as his sidekick. The original text is an uproarious read, but the artwork (composed entirely on yellow sticky notes) from animator Arthur Jones perfectly captures the narrator's insecurities and the humiliation involved in working for Superman.